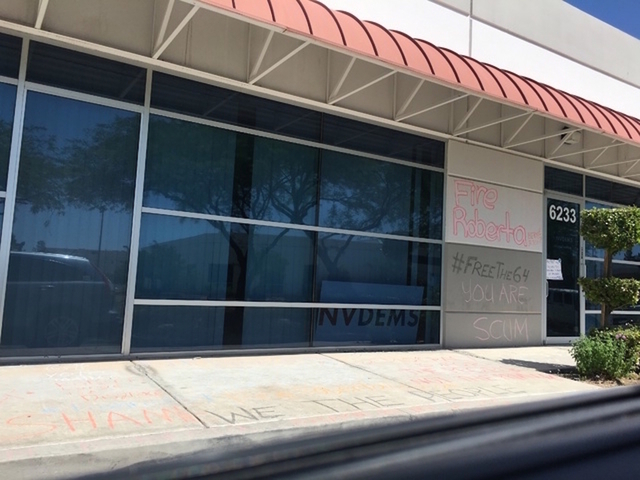 LAS VEGAS – The Nevada State Democratic Party’s headquarters in Las Vegas were closed Monday amid security concerns following a tumultuous state convention over the weekend. The move came after supporters of presidential candidate Bernie Sanders protested there Sunday, defacing walls and sidewalk with chalk to voice their displeasure with the party’s handling of the convention the day before. The convention is over, but the wider battle for order continues within the Nevada State Democratic Party. It’s playing out not in the shuttered headquarters, but on social media, where some Sanders backers relentlessly criticize and insult state party Chairwoman Roberta Lange. The outcry turned ugly over the weekend, when Lange’s cellphone number was posted online and she received death threats. A Metropolitan Police Department spokesman confirmed Monday that the agency is investigating the threats. He declined to comment further, as the investigation continues. Scores of voicemails and texts left on Lange’s cellphone and provided to the Las Vegas Review-Journal show that some came from out-of-state people. Meanwhile, the state party on Monday posted a statement online defending the outcome. The convention became unruly as Sanders supporters clashed with party leadership, including Lange, in disputes over procedural matters and the seating of delegates. Earlier in the convention, they had booed U.S. Sen. Barbara Boxer, D-Calif., a Hillary Clinton supporter who spoke at the event. The tumult was such that Lange needed a security detail. At the state convention, the party picked delegates for Sanders and Clinton to attend the Democratic national convention in Philadelphia in July. In the February caucuses, Clinton had edged out Sanders, an independent senator from Vermont. However, Sanders supporters packed the county conventions in April, and Clinton’s delegate lead over Sanders temporarily dropped from 20-15 to 18-17. The state party says the delegate math simply worked in Clinton’s favor because her campaign organized and got almost all of its delegates to the state convention. Clinton’s campaign had filled 98 percent of its 1,722 delegate slots at the convention with 1,695 people. Sanders’ campaign filled 78 percent of its 2,124 available slots with 1,662 people, the party said. Clinton regained her 20-15 delegate lead at the state convention as a result. In all, the state party will send 43 delegates. That figure includes eight superdelegates, elected officials and party leaders who are free to support who they wish. Party officials offer strong rebuttals to complaints. For example, Sanders supporters complained that 64 of their people weren’t allowed to be seated at the state convention. But the party says those people didn’t meet requirements such as registering to vote by May 1, or hadn’t responded to prior requests to fix unidentifiable or missing information. Six of those people in question were seated as delegates, the party said. Eight Clinton supporters were denied for similar reasons. It’s unclear how long the state party’s headquarters will be closed. That is under evaluation, according to the party. “And after starting this fire, they had no capacity — and no desire — to control their own supporters from hurling threats and insults and being disruptive to the proceedings,” the party said. In an interview, Sanders campaign spokesman Michael Briggs declined to comment on that allegation. Briggs stressed that Sanders had publicly encouraged everyone to have a good convention in a statement before the event. Both Sanders and U.S. Senate Minority Leader Harry Reid, D-Nev., had issued separate statements calling for all to work together respectfully and constructively. On Friday, a group of Sanders supporters were in a Clark County courtroom, where they lost a lawsuit filed against the State Democratic Party. The dismissed lawsuit had alleged that the state party improperly changed the deadlines to apply for party leadership positions. In that case, the state party has said a Sanders supporter improperly circulated a draft with an inaccurate date.